*IMPORTANT* The R2 is not R2! 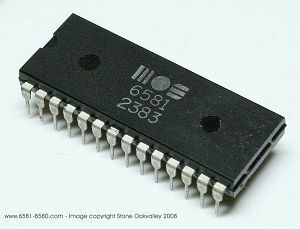 When the original SOASC= project started back in 2006, only 1 pcs of MOS6581 chip was selected for recording with the marking of MOS 6581R4 3387 14, which was at the time easy to see as R4 revision. It wasn't until almost 1 year later, the supposed R2 chip was added (in September 2007) to the recording queue with marking "MOS 6581 2383" and "KOREA AM212711" with no way of telling what revision it actually was, except for 2383 (Week 23 in year 83) I had to rely on other people's findings and classifications, including Wikipedia in that time period. 6581 R2 - Will say "6581" only on the package. Filter cutoff range was reduced to 11 bits and the MSB bit disconnected/forced permanently on, but is still on the die.The filter is leaky at some ranges and they tend to run hotter than other sid revisions. Made from 1182 until at least 1483. First 10 weeks or so of chips have ceramic packages (these usually appear on engineering prototypes but a few are on sold machines), the rest have plastic packages. 6581 R3 - Will say "6581" only, "6581 R3" or "6581 CBM" on the package. Had a minor change to the protection/buffering of the input pins. No changes were made to the filter section. Made from before 2083 until 1386 or so. The 6581R3 since around the week 47 of 1985 made in the Philliphines use the HMOS HC-30 degree silicon though the manufacturing process remained NMOS. It specifically mention R2 was produced to at least 1483 (Week 14, 1983) and the R3 was made from before 2083 until 1386 or so, which clearly puts the SOASC= chip that was categorized as R2 initially - actually are a R3 instead, due to the MOS 2383 (Week 23, 1983) marking! It doesn't matter if it says CBM, MOS or Commodore logo. Now, we are left with a decision to basically transform everything mentioning MOS6581R2 into MOS6581R3 instead, which covers information on website, graphics, databases and MP3 filenames including a whole lot more. Its not cool to change the past, but we feel it should be done to set things straight. This because now we do not have an R2 chip recorded ever, until now, with the introduction of the new ROTS (Return Of The SOASC=) project introduced in August 2015 the following chips are selected for recording (R4, R5 as before, R2 is now R3), and finally we will introduce a *REAL* R2 chip with the marking of "MOS6581 4982 - KOREA AH481704", which are the oldest chip I have in my collection, and with the marking of Week 49, 1982 it is for sure within the R2 time frame as Wikipedia mentions. Now, only the next few months can tells us how my chip actually sounds, but that's the beauty of the SOASC= project, its all about authenticity of some random guy's random Commodore 64's and its randomized sound. Bottom line is that the SOASC= ROTS project will now feature FLAC and MP3 recordings for the most common chips of MOS6581, which are R2,R3,R4 and finally the CSG8580R5 chip. The circle is complete. MOS 6581 2383, as pictured for SOASC= project lasting from 2006-2009. It was categorized as R2 based on information available on Wikipedia, but it is not, it is actually an R3! 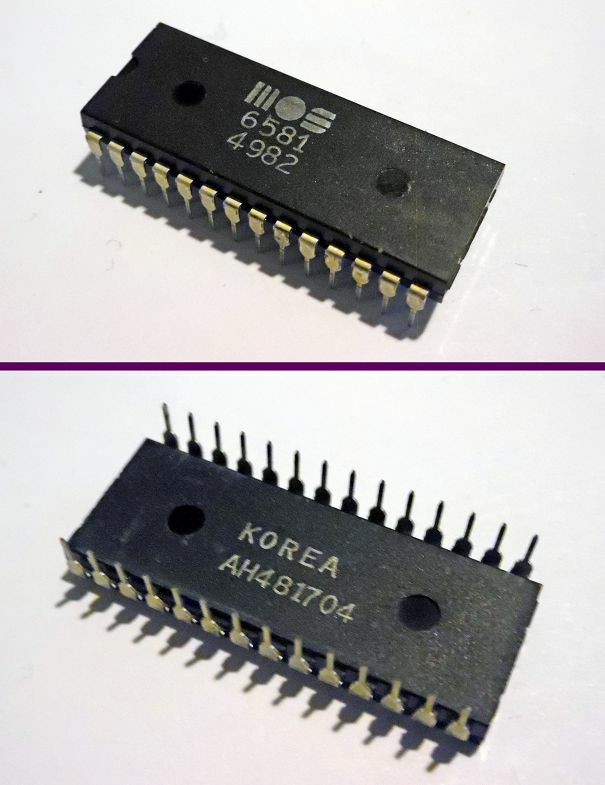 The new chip added to the recording queue during SOASC= ROTS 2015 project - the *REAL* MOS6581 R2 version!